Reproductions cause discussions when they are placed next to with the original they have been derived from. However, not solely original artworks age but so do replicas. Can a reproduction become authentic and original one day? The word reproduction often comes with a bad aftertaste in the original versus replica discourse from a Western setting: it’s always the lesser version of the original, a fake, counterfeit or forgery. Referring back to my first blog post Masterpieces Remastered: Rembrandt in the age of technical reconstruction it became clear that artworks – especially paintings - are valued for the unique material quality which provides the connection with humanity’s past and provides a tactile connection with the concept of the artist. However, as time passes it is not just the original work of art that ages and forms a bond with the past but so does the reproduction. In this sense it can be suggested that a facsimile itself can become original and authentic, as it also forms a connection with the past. 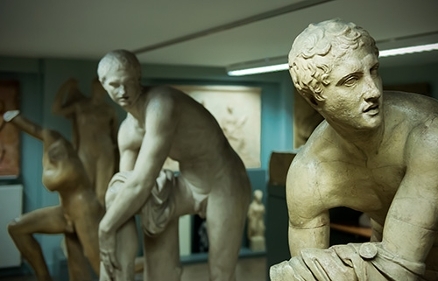 How does authenticity work and is it possible that reproductions become originals one day? But what are these so-called memory values? Art historians Nicole Ex (1993)  and David Lowenthal (1992)  explain that authenticity or memory values can be granted in various ways. One that is becoming more important because of contemporary art is conceptual authenticity: the thought and making process of the artist are the most valued aspects of an artwork. This would mean that The Bedroom by Vincent van Gogh in its original colors and brushstrokes without craquelé and discolorations would be the most important aspects of the painting, since it is closer to how van Gogh intended to paint this work, for example. Lastly, Lowenthal & Ex describe functional or contextual authenticity as a form of value granting that prefers the safeguarding of the original function of the object that holds a mania for showing things only in the environment that properly belongs to them. 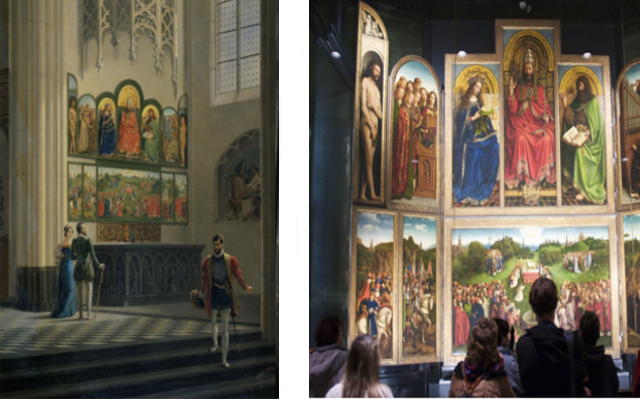 This would mean that Jan van Eyck’s original altarpiece should be displayed in a church instead of in a museum, where it becomes dislocated from its original setting. However, when we talk about authenticity nowadays, we usually refer to material authenticity: the material is what provides the unique experience we have when we come face to face to Vermeers’ Het meisje met de parel for instance. We seek proof of the past and a connection with the artist in the uniqueness of the material features of artworks. However, a copy is not unique unlike the original artwork, for it would not exist without the original, nor is it in any way directly connected to the thought or touch of an artist. How is it possible that a copy can have its own unique existence and connection to a past that in Riegl’s words satisfies humanity’s social, psychological and intellectual needs when the original artwork is still around? In terms of age value, it is clear that a copy can obtain this characteristic: all it takes is time for an object to obtain age value. However, in terms of memory value or authenticities the authentication in relation to the original is rather contradictory: the replica by its nature is considered as something that can never be ‘original’, but it has to have an aura to become acceptable. In other words: the acceptance of the replication in relation to the original happens when the reproduction fulfills an authenticity or memory value the original work of art cannot. This has happened, for example, to the copy of Michelangelo’s David in front of the Palazzo Vecchio or Lascaux II, a copy of the prehistoric cave in Lascaux, which became a historical monument. Both replicas have shifted from fulfilling a functional purpose or a replacement for the original, to autonomously authentic objects. Left: David, Michelangelo Buenarotti, 1501-1504, marble, 517 cm, Galleria della Academia, Florence. 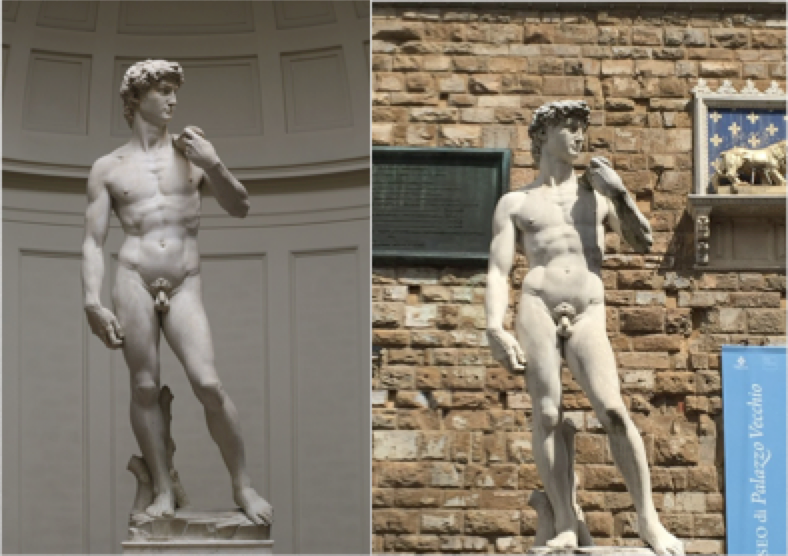 Right: Copy of David in front of the Palazzo Vecchio in Florence. In my opinion, reproductions can indeed become authentic. I want to emphasize that the authenticity of both the original and replica is a social construction that is not static, but changes over time according to what society considers to be more authentic. Shifts in the appreciation of the different memory values function, material or concept changes the meaning of the original, which can elevate the replica’s relevance and its own historical value detached from the original it was based on. I am therefore convinced that as time passes and the world changes around us, more copies can become original and authentic objects one day. © Liselore Tissen and Leiden Arts in Society Blog, 2019. Unauthorised use and/or duplication of this material without express and written permission from this site’s author and/or owner is strictly prohibited. Excerpts and links may be used, provided that full and clear credit is given to Liselore Tissen and Leiden Arts in Society Blog with appropriate and specific direction to the original content.